the trains. No-one was hurt, although one person was treated for shock at the scene. 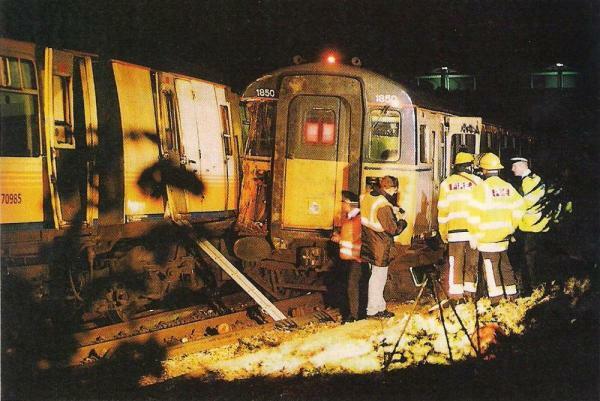 The collision took place at a crossover near the junction where the lines from Haywards Heath and Brighton to Lewes meet. There is no record of any previous train accident in this area. carriages, of class 421 ‘Mark 1' slam-door rolling stock. signal involved had not previously been passed at danger. of the Inspectorate that there is insufficient evidence to provide a realistic prospect of a conviction. The Train Protection and Warning System (T.P.W.S.) is due to be fitted across the network and to all trains by the end of 2003.
and the accident would have been prevented if it had been. taken by Connex Rail to address some staff management issues. Implementation of these actions will be monitored by HSE. Accordingly, we have no additional recommendations to make. (hereafter referred to as the empty train). passengers on the Hastings train. There were no injuries in the collision, although one person was treated for shock at the scene. collected by a bus. These operations were completed by 22.00. The Sussex Police declared the accident site a "scene of crime", allowing them to restrict access to it pending an investigation. signalling, normal working was resumed at 14.10 on the same day. The weather at the time of the accident was dry and clear. locking. All the units were fitted with the BR Automatic Warning System (AWS) and the Driver's Reminder Appliance (DRA). the driver does not respond to it on the approach to a signal at "caution" or "danger”. when the train is stopped at a red signal. AWS, DRA, and braking systems was carried out. No faults were found. line to Brighton. A crossover east of the junction enables trains from both directions to reverse. The lines from London, via Haywards Heath, curve sharply to the left on a radius of 200 yards as they pass through platform 1. 460 yards. The crossover where the collision occurred is 110 yards east of the junction. safety margin in cases where a train driver misjudges braking, is 110 yards, which is better than the standard for the line speed. unless the junction itself is clear. Railtrack's electrical control room at Brighton. route a decision was taken to reverse it at Lewes and send it empty to the depot at Brighton. which is fixed to the signal post at the top of the ramp at the end of the platform. signalman, who routed the empty train through platform 4 towards Brighton. left Lewes. The train started, passing signal LW3 at red, and accelerated until it reached about 20 mph. track circuit AH, thus fouling the junction. This very rapid response is much to the signalman's credit. probably moving at about 15mph in the opposite direction. Neither train was fitted with a data recorder. guard and one of the dispatchers on the platform combined to cause the accident. the platform starting signal is clear before giving this hand signal. start the train, looking out as he does so to ensure that all is well with his train. train if the train is drawn right up to the platform starting signal. sighting of signal LW3 or the "OFF" indicator. would not have blown his whistle if he had realised the starting signal was at danger. working through Lewes for the whole of this time. into the neutral position, which was what he had been taught to do at a red signal in the days before the DRA was introduced. switch into forward, putting the controller into notch 1, and looking out and back along his train to check on its safe departure. By the time he looked forward again his cab had passed the signal. The collision occurred a few seconds later. years. He had not previously been involved in a Signal Passed at Danger (SPAD) incident. of the way in that time. the leading end vestibule, then serious injuries or worse may have occurred. However, little detachment of internal fittings occurred. crash worthiness of rolling stock. modern trains have been designed to be more robust and resistant to collision damage. by a dispatcher on the platform. responsible for checking that signals are clear before indicating that the train may proceed. Connex and Driver Standards Managers have for some time been actively enforcing this. responsibilities were not clear, and that the platform despatch arrangements at Lewes had not been reviewed for some years. the local management team resigned their posts. have line management responsibility for these staff. fitted with the necessary equipment by the end of 2003. This should be accompanied by extension of platform 1 at its north end to fully accommodate 12 car trains. complete" signal to the train crew. platform starting signal at Red. accident. Accordingly, we have no further recommendations to make. preventing them. Details of SPADs nationally and the action being taken are being published monthly.